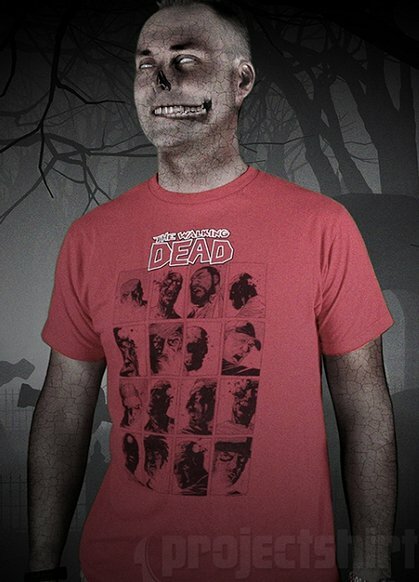 Never seen the show, but I’m guessing that if you’re a fan, you recognize a lot of these zombie faces. Or maybe in aggregate you recognize the overall vibe of the show as it emanates from this shirt design. I just can’t seem to get into the zombies, but I understand why people do. It’s some apocalyptic fantasy where just like the sheriff in this show, you have a fighting chance. Whereas if it was an alien apocalypse, or asteroid or bankers embezzling every resource and Monsanto destroying the food supply, and soulless corporate personhoods polluting every drop of water, you wouldn’t have a chance. It would just be on you in an instant and you’d be gone.